Your store will display items price according to the selected currency! 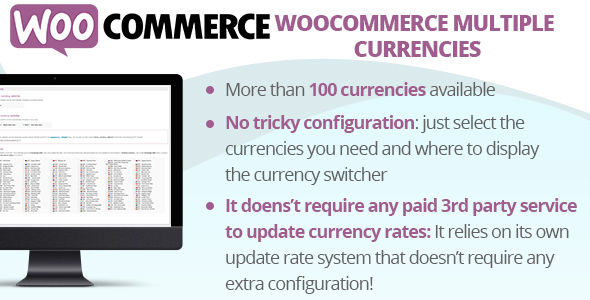 The WooCommerce Multiple Currencies is very straightforward: just install, select the currencies you wish to display and select the update rates frequency! It doesn’t require you to configure any paid 3rd party service to update rates or any additional tricky setting! It relies on its own update rate system that doesn’t require any extra configuration. on its own innovative update rates service without the need the shop admin to set any additiona tricky setting! added to any widget area through the Appearance -> Widget menu. As alternative, you can use the wcmc_currency_selector(); function to display the currency switcher in any template. Some payment gateway may be not accepting some currencies. In these cases, they won’t be available in the checkout page. On admin area, the base currency will be used as default currency.